I was awed by Tim Burton's creative mind. Alice in Wonderland, Sweeney Todd, The Nightmare Before Christmas, Edward Scissorhands. We all know the man behind these quirky movies, but did you know that Tim Burton also draws, creates characters, makes costumes, takes photographs and directs? That’s what I discovered when I visited the Tim Burton exhibit at the Los Angeles County Museum of Art (LACMA). I attended After Dark, an event for teens to see the Tim Burton exhibit. Some people were waiting in line for up to two hours! Luckily, my friends and I got a spot in line with some old friends near the entrance. We were grateful because some people, like my friend Jordan, got to see the exhibit for only 15 minutes before it closed, and she had been waiting in line since it opened. I felt butterflies in my stomach as I waited to go in. I was excited because Burton fascinates me. I tried to imagine what the exhibit would be like, but as soon as I entered the first room, I was awed by the artwork that could only come from his mind. I was fascinated as I carefully examined the unbelievable amount detail in the drawings. I saw some familiar characters, but some new ones as well. Some of his pieces actually made me shiver. As I turned a corner, right in front of me was a handful of sketches of the classic villain the Joker from Batman. I could hear his spooky laughter in my head and remembered how much he scared me when I was little. In contrast, I laughed out loud when I read Burton’s poem about a woman who had many eyes, and how wet he would get if she broke down and cried. I saw characters I had never seen before, like Oyster Boy, Toxic Boy and Stain Boy. I also saw doodles and drawings on napkins and hotel stationery that Burton just had to jot down, for yet another brilliant idea had come to his mind. We saw the actual scissors used in one of my favorite movies, Edward Scissorhands. Burton and Johnny Depp seem to have a close relationship. There was a letter on display addressed to Depp from Burton, frantically sharing an idea to change the script to make the audience laugh. I also learned other interesting things—Burton also directed movies as diverse as Batman, Pee-Wee’s Big Adventure, Planet of the Apes, and Charlie and the Chocolate Factory. Burton was born in 1958, right here in Burbank. He studied at the California Institute of the Arts (CalArts), and began his career working as an animator at Walt Disney Studios. He really turned Hollywood upside down because he truly changed the way people look at movies. 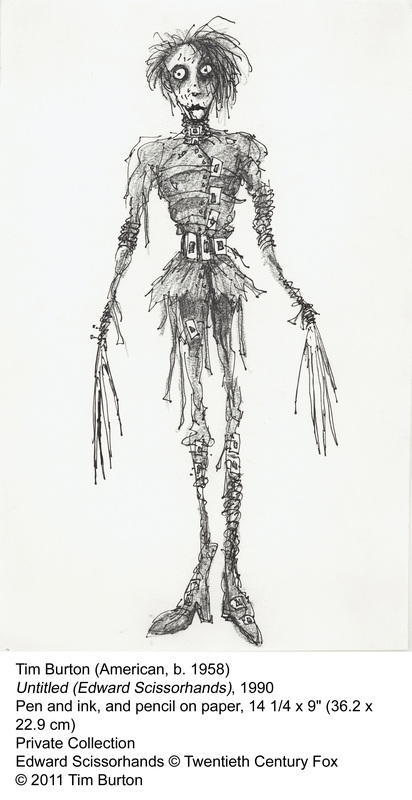 The exhibit was filled with almost everything Burton has created in his lifetime— every wall was covered in artwork. I liked it a lot, and it made me appreciate the hard work he must have put into every one of his movies and creations. Before the exhibit, I had only seen some of his movies and thought that he was a very wacky, creative and genius man. Now I’ve realized that he’s more than that. He puts so much effort and time into every piece of work he does, that I admire him even more. I hope I’ve convinced you, because this exhibit is really worth your time. It’s going until Oct. 31, and if you are under 18 you get in for free. For everyone else, it’s $20. Believe me, it’s worth it. You must purchase tickets for a specific date and time. Monday, Tuesday and Thursday noon to 8 p.m.
Friday noon to 9 p.m.